Lycamobile has announced a Black Friday sale for new customers. Plans priced $39 and lower have all been reduced to $19 for a customers first month of service. The $50 plan with 50GB of data at 4G LTE speeds has been reduced to $25 for the first month of service. 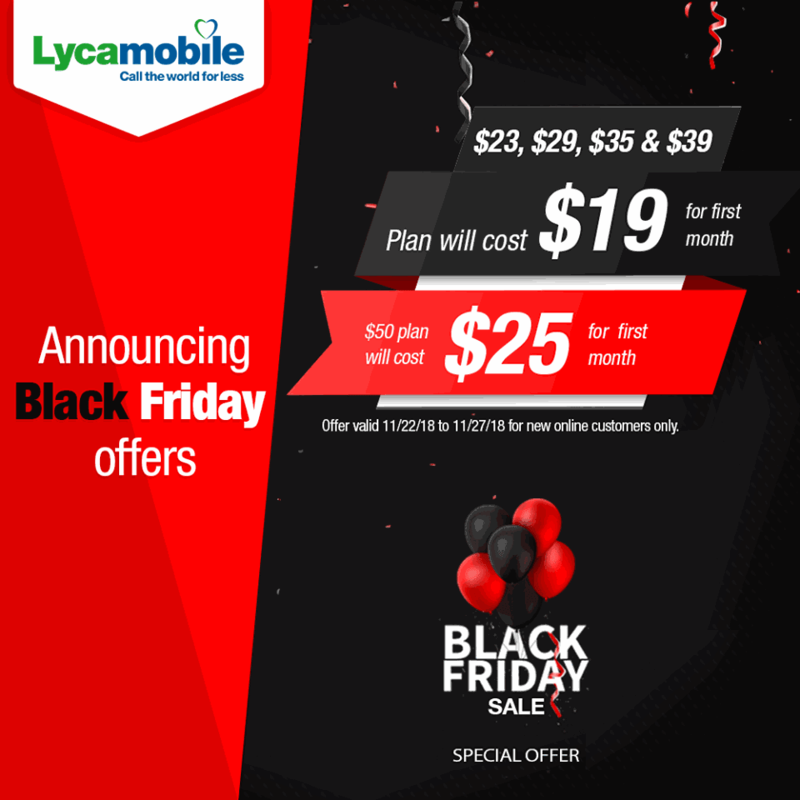 Lycamobile's Black Friday sale will go into effect starting on 11/22/18 and will last until 11/27/18. Sale pricing will be available to new customers only. All Lycamobile plans involved in the sale are shown below. All plans include unlimited talk, text, international talk, international text, and data with the specified amount of data at high speeds. The differences between each plan are highlighted. 1GB of data at LTE speeds plus $1.50 bonus international calling credit - regularly priced at $23/month. 4GB of data at LTE speeds plus $2.50 international calling credit - regularly priced at $29/month. 6GB of data at LTE speeds. No bonus international calling credit. Regularly priced at $35/month. 5GB of data at LTE speeds, plus $15 international calling credit, regularly priced at $39/month. The $50/month plan will be on sale for $25 for the first month. The plan includes unlimited talk, text and data with the first 50GB at 4G LTE data speeds. Unlimited international talk and text to over 75 countries is also included. Plan comes with free domestic roaming. Subscribers get 200 minutes and 200 text messages while roaming. Domestic roaming data is not available. Lycamobile is an MVNO that operates on the T-Mobile network. Not sure if this is the right deal for you? See how it compares to other phone plans on sale this month.